It doesn’t take a hurricane, tsunami, or epic event for a flood to become a monumental life disrupter. Like a too-heavy, buzzing beehive drooping from the branches of a live oak tree, the specter of water damage looms large over the heads of Lowcountry property owners. Surrounded by ocean, rivers, and waterways, the questions and confusion about insurance add mightily to the shadow cast by a potential flood. The landscape of flood insurance is changing, and there has never been a more apt cliché: Knowledge is power—power to protect property, power to safeguard investment, power to minimize cost. Witnessing the damage created by Mother Nature and her hurricanes should be enough to generate serious enthusiasm for seeking flood insurance. Add to that broken water heaters, bursting pipes, or damage caused by any manner of rising water, and having a flood insurance policy in place should be a no-brainer. 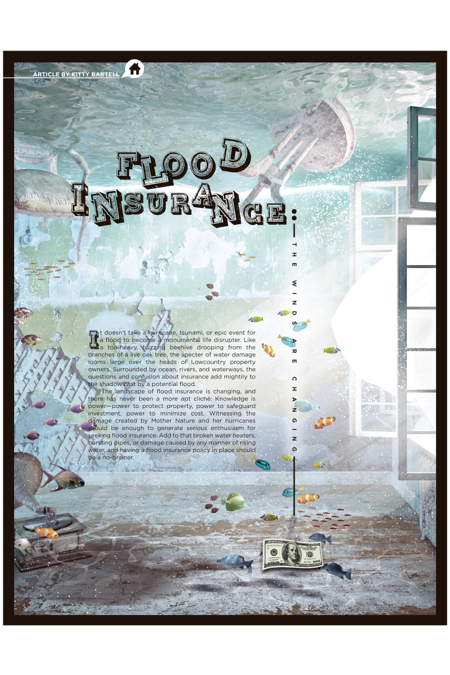 To date, the Lowcountry has enjoyed relatively favorable rates on national flood insurance premiums; however, as of April 1, 2016, the rules are changing, making it particularly important to know what the options are and how to best care for your investments. By that date, if you have a mortgage that predates the exisiting federal flood insurance program, and you do not have flood insurance, the exisiting favorable rates will no longer be available, should you get elect to purchase coverage, said Lisa Jones, principal and founder of Carolina Flood Solutions, recognized by the National Association of Realtors as a leading expert in the field. The Federal Emergency Management Act (FEMA) which manages the National Flood Insurance Program (NFIP) is reforming the program to make it more sustainable, beginning with the removal of long-standing subsidies. Per FEMA and the U.S. Department of Homeland Security, homes built pre-FIRM have enjoyed subsidized flood insurance rates that do not accurately reflect the property’s true risk, because they were constructed before the first Flood Insurance Rate Maps (FIRM) were drawn. 1) FEMA allows an NFIP policy to be purchased in addition to private flood insurance (be sure to check with private insurers regarding their own rules). 2) Existing NFIP policies may be transferred to new owners when a property is sold or when it has been transferred through inheritance. If an active policy is not in place, the rates to purchase a policy will be significantly higher. 3) NFIP policies that are active as of April 1, 2016, and those that have been in effect since the pre-FIRM date, will enjoy lower, grandfathered rates—premiums will not be affected by these changes. 4) NFIP policies that are identified as pre-FIRM will no longer be rate-subsidized and can expect an annual increase until they reach the full risk rate premiums set by FEMA. “We’ve been told for years now by FEMA that they’re going to be releasing new maps,” said Nicole Dixon, town senior planner. “Once we do get them, there will be public meetings for the public to come and see how the maps are changing.” Nixon is also the town’s community rating system coordinator. “The CRS program is a voluntary program where we go above and beyond FEMA’s technical standards, and they grade us on activities that we do. Right now we are a class five, so everyone in the regular floodplain receives a 25 percent discount on their national flood insurance,” she said. Please visit the following websites for more information: The Town of Hilton Head Island at hiltonheadislandsc.gov; Carolina Flood Solutions at carolinafloodsolutions.com; and Hilton Head Area Association of Realtors at hhrealtor.com. White Kitchens are White Hot! January 2012: From the Editor - May I have a Do-Over Please?